The topic of this article is what I call a "slice of life." It paints the picture of a setting the everyday people passed through. No celebrities or race drivers, just the average person coping with the challenges of either going to and returning from the Indianapolis Motor Speedway and the first Indianapolis 500. This article describes the schedules of the "Big Four" railroad line, and the cities from which special trains ran to the Hoosier capitol. 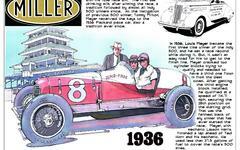 All converged at the famed Indianapolis Union Station, and from there commuter lines ran to the Speedway. Of an estimated total attendance at the first Indianapolis 500 (85,000) railroad officials estimated that 88% of them arrived by these commuter lines. I'm not sure of that, but that's what the article claims. There is color in this article as well, such as the man with cement sack that had its bottom fall out, dropping several empty whiskey bottles onto the platform, breaking at least one. Another story has it that police officer George R. Pinnell was trampled by the throng, but suffered only bruises, a torn uniform and a bent badge. If you want a sense of historical context, this is the kind of article that provides it. This article was published in the May 31, 1911 Indianapolis Star.